Canadian businesses must be rethinking their payments strategies and migrating to a real-time payments environment. Boston, December 6, 2018 – Real-time payments are beginning to emerge in the Canadian payments ecosystem through innovations such as the card networks’ push-to-card solution and the modernization of Canada’s payments infrastructure. Real-time payments allow businesses to drive innovation in their payment processes to improve the customer experience and at the same time enable businesses to more cost-effectively and securely disburse funds. Yet despite all of the innovation in Canadian payments, most businesses that owe consumers money still issue payments using automated funds transfer or checks. 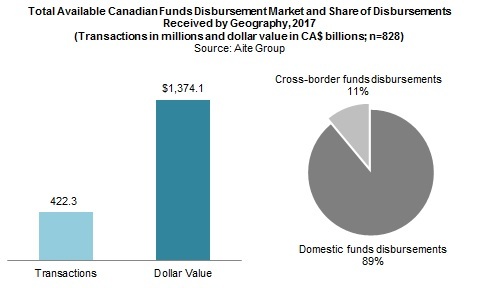 This report examines the state and size of the Canadian B2C disbursements market, the payment methods used to make disbursements, and consumer payment method preferences. It is based on a Q4 2017 quantitative study of 1,137 Canadian consumers aged 18 or older, which Visa Inc. commissioned Aite Group to conduct. This 37-page Impact Report contains 13 figures and 19 tables. Clients of Aite Group’s Retail Banking & Payments service can download this report, the corresponding charts, and the Executive Impact Deck. This report mentions Amazon, Apple, ATB Financial, Facebook, IBM, Interac, Lyft, Payments Canada, PayPal, Samsung, TD Bank, Uber, and Visa.